Late night drinking when JOB’s not around. It wasn’t my fault! Smokee sent the Wife a text! Funny – I almost believe you. I’m gonna have to back Matthew up on this one. I jokingly sent Deirdre a text ’round midnight last night telling her to drag herself and Matthew to my house for some Blanton’s. They were at my door within five minutes. Blanton’s! We have the horseys for all but the “T” at this point, I think. I have no idea what you’re talking about, but it’s adorable. Horseys! And thank you, Smokee, for speaking up on my behalf. I imagine there was some delight in the novelty of being able to do so without prevarication. Oh, good grief. Looks like I’ve got a busy weekend ahead of me. Let’s make it our focus for New Orleans this year. I’ve got your back, Lickona. And I never knew there were different horseys!I need to get busy collecting. It appears you can actually buy the collection from the site without doing the grunt work of drinking the Blanton’s, but why would one do such a thing? Considering all the times we’ve outlasted the rest of the crowd and nearly made it to breakfast, and without any effort, your words cut deep, JOB. You know, I thought of you as soon as he mentioned that – you and JOB are the two people I have fallen asleep on most often, I think. And you never wondered why there was French’s yellow mustard in your pockets the following morning…? Is that an ice cube? 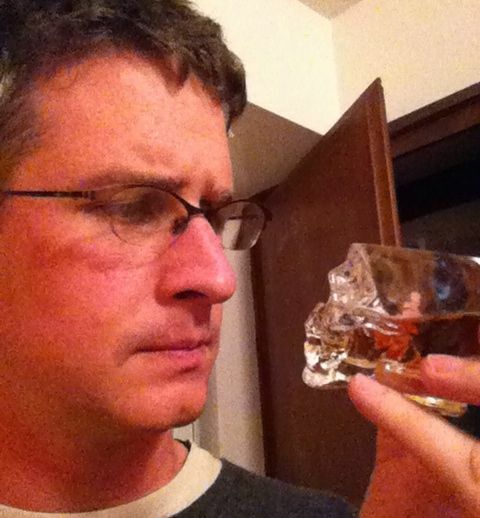 No, Potter, that is a glass skull, half-filled with bourbon. It’s a crystal skull, like in the fourth Indiana Jones movie. Lickona’s portraying Shia LaBeouf after drinking from a false grail.